Add the final touch to your Dorothy costume with these gingham hair pieces. The hair bows are a perfect addition to Dorothy's signature braids and measures 2 1/2" wide. They have a blue and white checkered pattern and easily clip into hair. 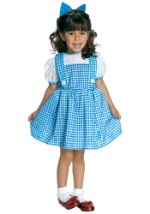 You'll be ready to find your way home from the Land of Oz when you wear these bows with any of our Dorothy dresses.